An alternative to scrambled eggs. It’s nice to imagine recipes for ingredients you did not know how to cook with. Scrambu has made Tofu part of our regular diet easily. Sauté the onion in a bit of oil until translucent. Season with a pinch of salt. Add the mustard seeds until they start popping. Add the tomatoes sliced in half or quarters and cook for a few minutes until softened. Crumble the tofu with your hands into the mixture. Add the turmeric and paprika and stir with a wooden spoon. Add as much turmeric as you need to make the tofu look like scramble eggs. Cook the tofu with your spices for about five minutes. Season with the rest of your salt and pepper. Turn the heat off and add the grated cheese. Toss until the cheese it melts nicely. Taste and season more if required, tofu is very bland and might need more salt than you thought it does. Be creative with your spices in tofu. You can make Indian, Thai or Italian flavoured scrambu as we do or make your own version. Coriander goes really well with garam massala spices and you can add a chilli pepper too. But the basil and tomato version is very tasty too with a pinch of cinnamon or pimento berries. Enjoy on warm buttered toast. 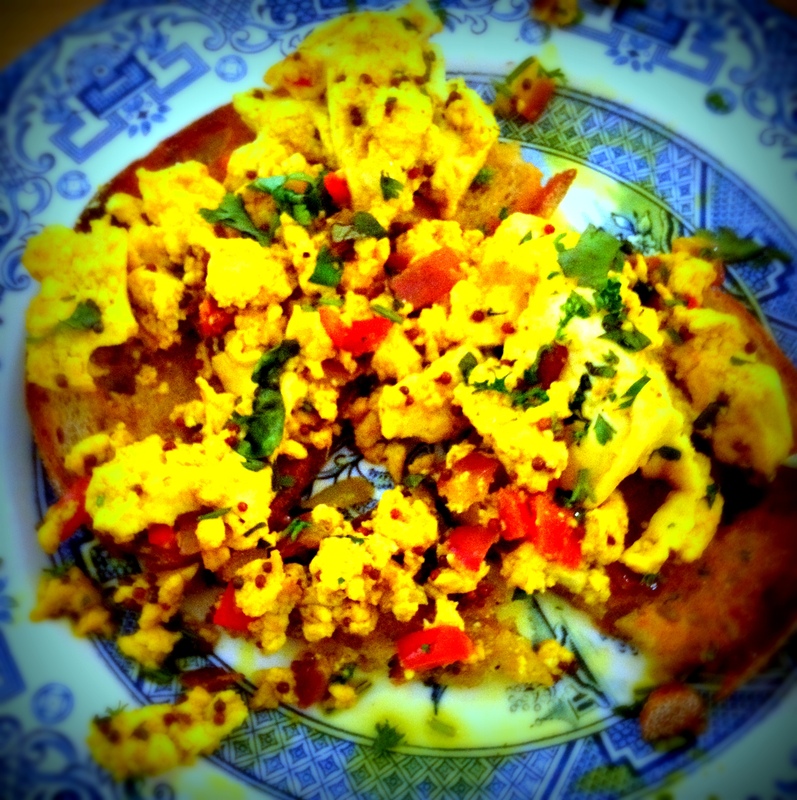 This entry was posted in gluten free, Recipes, Vegan and tagged alternative, egg free, liaskitchen, scrambled eggs, scrambu, Tofu.